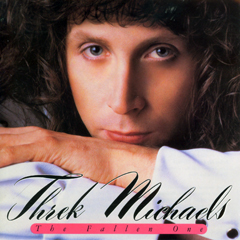 The Fallen One is Threk Michaels' fifth studio album, and the second that he would record with the talented studio band of guitarist Marc Speer, bassist Mike Joyce and drummer Tommy Wells. The Fallen One also features guest performances by noted guitarists Brent Rowan, who has played with Bob Seger, Hank Williams Jr and Robert Plant, among others; and Jerry McPherson, who has played with Amy Grant, Rodney Crowell and many more. This was also the first time that Threk would work with the legendary vocal group The Jordanaires, who have backed up legends like Elvis Presley and Ricky Nelson. The Jordanaires would go on to work with Threk on both of his Ricky Nelson tribute albums, As True As You and Lonely Always. A studio problem damaged the original tapes that were recorded for The Fallen One, resulting in the loss of the album's tenth song. Working with producer/engineer John Hurley, Threk managed to rescue and restore the original nine songs for this CD. Originally released on both compact disc and vinyl LP by Nashville's Royal Records, this critically-acclaimed album won Threk fans worldwide and even received radio airplay as far away as Poland and Germany. Visit Threk on his MySpace page! We have a limited number of copies of Threk's The Fallen One available for purchase. Buy the CD direct from Excitable Press for $9.99 postpaid through PayPal!